Passengers are welcome to board our ship at 6:00 p.m. After comfortably settling into your cabins, we'll introduce our crew at a welcome cocktail before dinner. This evening, join us for a tour by river boat of Amsterdam. We'll cruise towards Nijmegen. Enjoy some free time in the city before we start cruising to Krefeld, arriving late in the evening. 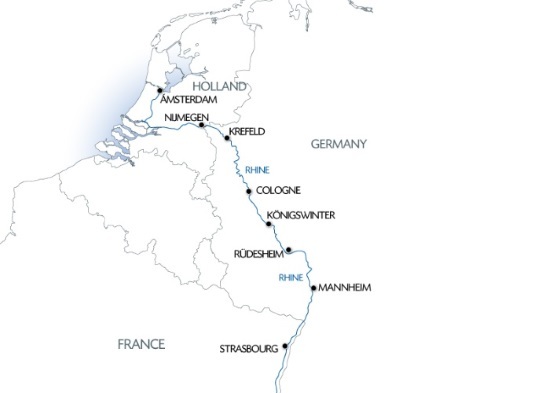 The morning will be spent cruising towards Cologne, passing through Düsseldorf and Zons. Enjoy some free time in the city center. We'll return on board and cruise to Königswinter. Enjoy an evening of onboard entertainment. We'll cruise along the most beautiful section of the romantic Rhine, seeing numerous castles nestled among the famous vineyards, and the legendary Lorelei Rock. Enjoy some free time in Rüdesheim or join us on an excursion: Tour of Rüdesheim by tourist train and visit to the Museum of Mechanical Musical Instruments. Tonight is our New Year's Eve dinner and evening. We'll cruise to Mannheim. Join us on an excursion: Guided tour of Heidelberg, city combining dreamy romanticism and splendid location. Tonight is our gala dinner and evening. We'll start cruising towards Strasbourg. Celebrate the New Year in a unique way on a romantic Rhine cruise! Discover Amsterdam and its charming canals but also Heidelberg, one of the most beautiful cities in Germany. Do not miss out on Cologne, famous for its cathedral, and one of the most dynamic cities in Germany.